Mayo 1-10 NUIG 2-5 (Flanagan Park, Ballinrobe, 7/1/2006). MAYO: Paul Tiernan; Ollie Feeney, Damien Dempsey, Colm Cafferkey; Dermot Costello, Richie Feeney, James Rafter (0-1); James Gill, Billy Joe Padden; Jimmy Killeen (0-1, free), Ger Brady (0-3), Damien Munnelly (0-1); Pat Casey (0-3), Rory Hannick (0-1), John Prenty (1-0). Subs: Barry Regan for Prenty, Liam O’Malley for Feeney, Aidan Higgins for Dempsey, Jarlath O’Malley for Munnelly. Mayo 0-14 IT Sligo 1-9 (Fr O’Hara Park, Charlestown, 15/1/2006). 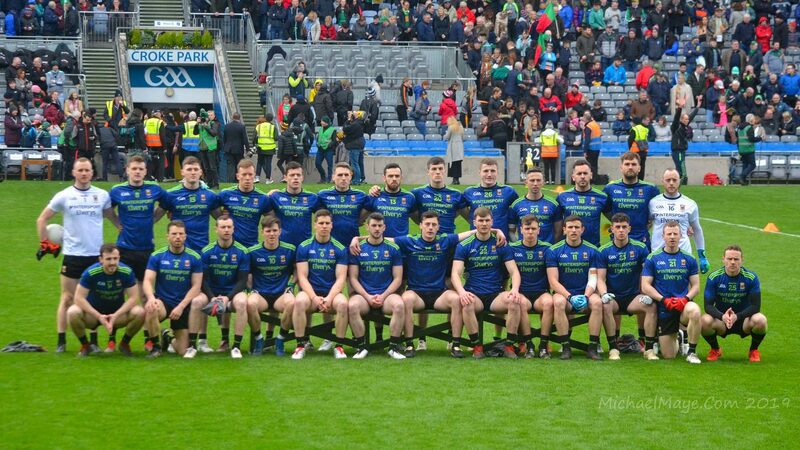 MAYO: David Hannon; Colm Cafferkey, Paul Finnerty, Kevin Deignan; Eanna Casey, Aidan Higgins, Liam O’Malley; Barry Moran, James Ryan; Niall Lydon (0-1), Ger Brady (Claremorris) (0-2), James Gill (0-3); Barry Regan (0-2), Martin Keane, Jarlath O’Malley (0-3). Subs: Dermot Geraghty for Cafferkey, Ger Brady (Ballina) (0-2) for Brady, Pat Kelly for Casey, Alan Dillon (0-1, free) for Ryan, Pat Casey for Keane. Roscommon 1-8 Mayo 2-12 (Peadar Early Memorial Park, Ballinlough, 22/1/2006). MAYO: Fintan Ruddy; Dermot Geraghty, Pat Kelly, Aidan Higgins; Brian Ruane, James Nallen, Alan Feeney; James Gill (0-1), David Brady; Stephen O’Grady (0-1), Ger Brady (Ballina) (1-0), Jarlath O’Malley; Pat Casey (1-1), Barry Regan (0-3), Alan Dillon (0-5, three frees). Subs: Ronan McGarrity for D Brady, David Heaney for Geraghty, Liam Brady for O’Malley, Ger Brady (Claremorris) (0-1) for O’Grady, Peadar Gardiner for Feeney. FINAL: Galway 2-8 Mayo 0-9 (Tuam Stadium, 26/2/2006). MAYO: Fintan Ruddy; Dermot Geraghty, David Heaney, Aidan Higgins; Brian Ruane, Pat Kelly, Peadar Gardiner (0-1); Shane Fitzmaurice, James Gill (0-1); James Rafter, Ger Brady, Alan Dillon; Austin O’Malley (0-3, one free), Barry Regan, Pat Casey. Subs: Conor Mortimer (0-3, one free) for Regan, Billy Joe Padden for Rafter, David Brady for Fitzmaurice, Liam O’Malley for Ruane, Rory Hannick (0-1) for Dillon. Kerry 1-14 Mayo 1-15 (Tralee, 4/2/2006). MAYO: F Ruddy; T Howley, D Heaney, K Higgins; P Kelly (0-1), J Nallen, P Gardiner; BJ Padden (1-2), J Gill (0-1); A Dillon (0-1, a free), G Brady (0-4), A Moran (0-2); C Mortimer (0-3, frees), A O’Malley, P Casey (0-1). Subs: D Geraghty for P Gardiner, B Moran for A O’Malley (both 58 mins), L Brady for P Casey (60 mins). Mayo 1-15 Offaly 0-10 (McHale Park, 12/2/2006). MAYO: F Ruddy; T Howley, D Heaney, K Higgins; P Kelly (0-1), J Nallen, P Gardiner (0-1); BJ Padden, J Gill; A Dillon (0-4, three frees), G Brady (0-2), A Moran (0-3); C Mortimer (0-4, two frees), A O’Malley, P Casey (1-0). Subs: B Regan for O’Malley (38 mins), B Moran for A Moran (58 mins), R Hannick for Gill (63 mins), A Durkan for Casey (69 mins). Mayo 0-19 Fermanagh 1-14 (McHale Park, 12/3/2006). MAYO: J Healy; D Geraghty, L O’Malley, K Higgins; P Kelly (0-2), J Nallen, P Gardiner (0-1); J Gill (0-1), R McGarrity; BJ Padden (0-2), G Brady (0-4), A Costello (0-3), C Mortimer (0-5, free, ‘45), A O’Malley, A Dillon. Subs: D Heaney for Geraghty (41mins), K O’Neill (0-1) for A O’Malley (50 mins), P Casey for Costello (55 mins), B Ruane for Nallen (69 mins). Mayo 0-12 Cork 0-7 (McHale Park, 19/3/2006). MAYO : J Healy; L O’Malley, D Heaney, K Higgins; P Kelly, J Nallen, P Gardiner (0-1); J Gill (0-1), R McGarrity; A Costello, G Brady (0-1) , BJ Padden; A Moran (0-1), A O’Malley (0-1), A Dillon (0-7, five frees). Subs: L O’Malley or A Costello (50 mins), L Brady for G Brady (55 mins), P Casey for A O’Malley (64 mins) T Howley for Heaney (66 mins). Dublin 4-10 Mayo 1-10 (Parnell Park, 25/3/2006). MAYO: J Healy; L O’Malley, D Heaney, K Higgins; P Kelly, J Nallen, P Gardiner; J Gill, B Moran; A Dillon (0-3, 1f), G Brady, BJ Padden; A Moran (0-2), A O’Malley (1-1), A Durcan (0-2). Subs: T Howley for Kelly (44 mins), K O’Neill (0-2, 2f) for Durcan (48 mins), A Higgins for Brady (52 mins), P Casey for Brady (64 mins). Mayo 1-8 Tyrone 0-11 (McHale Park, 9/4/2006). MAYO: J Healy; D Heaney, L O’Malley, K Higgins; T Howley, J Nallen, P Gardiner (1-0); J Gill, R McGarrity; BJ Padden, A Dillon (0-1, free), G Brady (0-1); A O’Malley (0-3), K O’Neill (0-2, one free), A Moran. Subs: D Brady (0-1) for Gill (49 mins), T Mortimer for O’Neill (60 mins). Mayo 1-6 Galway 1-11 (Semi-final, McHale Park, 16/4/2006). MAYO : J Healy; T Howley, D Heaney, L O’Malley; K Higgins, J Nallen, P Gardiner; J Gill, R McGarrity; BJ Padden, G Brady, A Dillon (0-2, frees) ; A Moran, A O’Malley (1-3, two frees), A Durcan. Subs : D Brady for Durcan (30 mins); T Mortimer (0-1) for Gill (38 mins); P Kelly for Howley (56 mins). Preliminary round: London 0-8, Mayo 1-18 (Ruislip, 28/5/2006). MAYO: J Healy; D Geraghty, L O’Malley, K Higgins; P Kelly, J Nallen, P Gardiner (0-1); D Heaney, P Harte; A Moran (0-2), G Brady (0-1), A Dillon (0-1); C Mortimer (1-8, 0-7 frees), C McDonald (0-3), A O’Malley. Subs: D Brady for Kelly, BJ Padden for Dillon, K O’Neill (0-1) for A O’Malley, B Moran (0-1) for Harte, M Conroy for A Moran. Semi-Final: Leitrim 1-9 Mayo 1-10 (Carrick-on-Shannon, 25/6/2006). MAYO: J Healy; D Geraghty, L O’Malley, K Higgins; D Heaney, J Nallen, P Gardiner; R McGarrity, P Harte (0-1) ; BJ Padden, G Brady (1-0), A Dillon (0-1, free); C McDonald (0-2), C Mortimer, (0-4, two frees), A Moran (0-1). Subs: A Kilcoyne (0-1) for A Dillon, P Kelly for D Heaney, J Gill for A Kilcoyne, B Moran for G Brady. Final: Mayo 0-12 Galway 1-8 (McHale Park, 16/7/2006). MAYO: J Healy; D Geraghty, L O’Malley, K Higgins; D Heaney, J Nallen, P Gardiner; R McGarrity, P Harte (0-1); BJ Padden (0-1), G Brady (0-1), A Dillon (0-2, one free); A Moran, C Mortimer (0-4, two frees), C McDonald (0-2, 45, free). Subs: K O’Neill (0-1) for A Moran (33 mins), T Mortimer for G Brady (56 mins). Quarter-Final: Laois 0-15, Mayo 0-15 (Croke Park, 13/8/2006). MAYO: J Healy; D Geraghty, D Heaney (0-1), K Higgins; A Higgins, J Nallen, P Gardiner; R McGarrity, P Harte; BJ Padden (0-1), G Brady, A Dillon (0-2); K O’Neill (0-1), C Mortimer (0-6, two frees), C McDonald (0-1, 45). Subs: B Moran for O’Neill (44 mins), A Kilcoyne (0-2) for Brady (44 mins), A Moran (0-1) for McGarrity (52 mins inj), T Howley for A Higgins (59 mins), P Kelly for Nallen (62 mins). Quarter-Final (replay): Mayo 0-14 Laois 0-11 (Croke Park, 20/8/2006). MAYO: D Clarke; D Geraghty, D Heaney (capt), K Higgins (0-1); A Higgins (0-1), J Nallen, P Gardiner; R McGarrity (0-1), P Harte; BJ Padden (0-1), G Brady (0-1), A Dillon (0-2, one free); M Conroy, C Mortimer (0-5, three frees), C McDonald (0-1). Subs: A Kilcoyne (0-1) for Padden (28 mins), K O’Neill for Conroy (29 mins), B Regan for O’Neill (43 mins), A Moran for Brady (55). PRELIMINARY ROUND: Leitrim 0-6 Mayo 0-13 (Pairc Sean MacDiarmada, Carrick-on-Shannon, 17/3/2006). MAYO: Kenneth O’Malley; Trevor Howley, Ger Cafferkey, Keith Higgins; Chris Barrett, Tom Cunniffe, Colm Boyle; Seamus O’Shea (0-1), Barry Moran (0-3); Aidan Campbell (0-1), Joe Dillon, Aidan Kilcoyne (0-3, one free, one ’45); Mark Ronaldson (0-2), Simon McGuinness, Michael Conroy. Subs: Enda Varley (0-1) for Conroy, Sean Ryder for McGuinness, Marcus Hannick (0-1) for Dillon, Kevin Costello for Campbell. SEMI-FINAL: Roscommon 2-8 Mayo 1-19 (Kiltoom, 1/4/2006). MAYO: Kenneth O’Malley; Trevor Howley, Ger Cafferkey, Keith Higgins; Chris Barrett, Tom Cunniffe, Colm Boyle (0-1); Seamus O’Shea, Barry Moran (0-1); Aidan Campbell (0-1), Joe Dillon, Aidan Kilcoyne (0-12, ten frees); Mark Ronaldson (1-2), Marcus Hannick (0-1), Michael Conroy (0-1). Subs: Sean Ryder for Campbell, Kevin Costello for Ronaldson, Alan Joyce. FINAL: Mayo 0-15 Galway 1-5 (MacHale Park, 8/4/2006). MAYO: Kenneth O’Malley; Trevor Howley, Ger Cafferkey, Keith Higgins; Chris Barrett (0-1), Tom Cunniffe, Colm Boyle; Seamus O’Shea, Barry Moran; Aidan Campbell (0-2, one free), Joe Dillon (0-2), Aidan Kilcoyne (0-2, one frees); Mark Ronaldson (0-1), Marcus Hannick (0-2), Michael Conroy (0-5, two frees). Subs: Kevin Costello for Dillon, Sean Ryder for Kilcoyne. SEMI-FINAL: Mayo 1-12 Tyrone 0-14, after extra-time (Breffni Park, Cavan, 23/4/2006). MAYO: Kenneth O’Malley; Trevor Howley, Ger Cafferkey, Keith Higgins; Chris Barrett (0-1), Tom Cunniffe, Colm Boyle (0-1); Seamus O’Shea, Barry Moran (0-1); Aidan Campbell (0-4, two frees), Joe Dillon, Aidan Kilcoyne; Mark Ronaldson (1-0), Marcus Hannick (0-1), Michael Conroy (0-4, one free). Subs: John Healy for O’Shea, Kevin Costello for Kilcoyne, Sean Ryder for Dillon, Henry McLoughlin for Healy (et), Aidan Kilcoyne for Ronaldson (et), Alan Joyce for Cafferkey (et). FINAL: Mayo 1-13 Cork 1-11 (Cusack Park, Ennis 7/5/2006). MAYO: Kenneth O’Malley; Trevor Howley, Ger Cafferkey, Keith Higgins; Chris Barrett (0-1), Tom Cunniffe, Colm Boyle; Seamus O’Shea, Barry Moran; Aidan Campbell, Joe Dillon, Aidan Kilcoyne (1-6, four frees and a sideline); Mark Ronaldson (0-1), Marcus Hannick, Michael Conroy (0-3). Subs: Sean Ryder for Boyle, Kevin Costello (0-1) for Dillon, Enda Varley (0-1) for Hannick. SEMI-FINAL: Leitrim 2-7 Mayo 2-14 (Pairc Sean MacDiarmada, Carrick-on-Shannon, 25/6/2006). MAYO: Alvin McCallig; Liam Tunney, Frank Burke, Kevin McLoughlin; Kieran Barrett, Brian Gibbons, Anthony Murray; Tom Parsons (0-1), Donal Gallagher; Keith Glynn, Pearse Hanley (0-8, five frees), Sean Prendergast (0-1); Liam Lydon (1-0), Gerry O’Boyle (0-2), Mikey Sweeney (1-2). Subs: Brian Gallagher for Glynn, Damien Keane for Prendergast. FINAL: Mayo 0-9 Roscommon 0-12 (MacHale Park, 16/7/2006). MAYO: Alvin McCallig; Liam Tunney, Frank Burke, Kevin McLoughlin; Kieran Barrett, Brian Gibbons, Anthony Murray; Tom Parsons (0-1), Donal Gallagher; Sean Prendergast, Pearse Hanley (0-3, one free), Keith Glynn (0-1); Gerry O’Boyle (0-1, free), Liam Lydon, Mikey Sweeney (0-3). Subs: Damien Keane for Murray, Enda Kenny for O’Boyle, Brian Gallagher for Glynn. QUARTER-FINAL: Kerry 2-7 Mayo 0-9 (Cusack Park, Ennis, 30/7/2006). MAYO: Alvin McCallig; Liam Tunney, Brian Gibbons, Ruaidhri O’Connor; Kevin McLoughlin, Kieran Barrett, Johnny Griffiths; Tom Parsons, Damien Egan; Pearse Hanley (0-1, free), Liam Lydon (0-2), Thady Gavin; Donal Gallagher (0-1), Damien Keane (0-2, frees), Mikey Sweeney. Subs: Donal Vaughan for Griffiths, Brian Gallagher (0-1) for Egan, Gerry O’Boyle (0-1) for Sweeney, Conor Jordan (0-1) for Gavin.